Shawn Woods with one of the big aerial views of what today is the wildlife area he manages. Last week I had a brief visit in his office with Shawn Woods, manager of the E.E. Wilson Wildlife Area. And he hauled out huge reproductions of aerial photos I had never seen before. The aerials looked like they were taken from a very great height, maybe ten or twenty thousand feet. One showed the present wildlife area when it was a tranquil region of fields and farms. The second, taken in 1944, showed the mass of barracks and other buildings, including churches and movie theaters, after the government had taken over the land and turned it into a training base for infantry divisions during the Second World War. And then there was a similar view of the area once most of the buildings had been demolished after the base was closed. There is lots of published material on Camp Adair and its history. For a shorthand version, you might take a look at an exhibit produced for the Archives Division of the Oregon Secretary of State on Oregon history in World War II. It’s available here. One thing that is obvious but might bear pointing out anyway: Today we think of Camp Adair mostly as the area of the wildlife refuge and the nearby city of Adair Village, but the camp was vastly bigger than that. The aerial of the present wildlife area shows scores of buildings. That is where the troops were housed, fed and entertained. Woods told me that the foundation of one of the movie theaters of the training base had only recently been found again and, if I understood him right, cleared of encroaching brush. But the actual military installation during the war comprised something like 60,000 acres of former farm and forest land, mostly in Polk County and stretching almost to the outskirts of Monmouth. It’s in that vast open territory where the training took place. And it’s in that area where the government has, in recent years, done repeated surveys to make sure no potentially dangerous ordnance was left in the ground. The bird’s eye view of Camp Adair in 1944. North is to the left. The right-hand vertical line in the center is today’s Camp Adair Road. 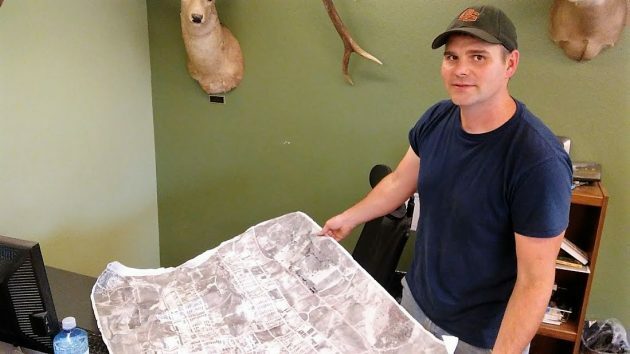 On September 16, Adair History Day, there will be a presentation by Daniel Pettit, who performed the most recent survey. He will discuss that and what plans there are for the future concerning Camp Adair, or the part owned by the EE Wilson Wildlife refuge. It will take place at Santiam Christian High school, 1pm in the Pastega room. If my memory is correct the site for Camp Adair was made because of the similarity to the terrain and climate of France. Thus the troops were trained under some of the same conditions they faced upon arrival in Europe. I heard the baguettes in the mess hall were not as good as the ones found in France. But seriously thanks for the article. WWII had a big impact on the mid-valley area, and it is always important to remember the people, places and buildings from that area. 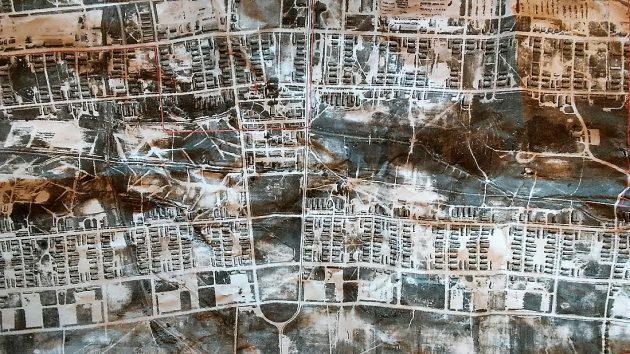 Any chance you can post high res-res scans of the aerial photos? I took photos of the aerials. I doubt the original negatives exist, so there’s little chance high-resolution reproductions. That’s my guess, anyway.